An earthy, rich Turban hardneck Garlic. Know where your food comes from. - Order Xian direct from our growers below - And Save. Harvests in late spring or early summer - stores about into mid fall. Xian -- Order now for shipping in early fall. Xian is a beautiful and mysterious garlic that everyone should grow if they can. First, their beauty makes you say "Wow" - they are very white with radical red thick vertical stripes like a peppermint stick. Now, the mystery, they were sent to Chester Aaron, author of "Garlic is Life" and many other works, from a woman from Chinatown in San Francisco and he has lost touch with her and doesn't know where they came from originally. A beautifully colorful one that harvests very early in the season. most form hardnecks and have lots of purple in rather flaky outer bulb wrappers that are easy to peel. The cloves are tannish with purple stripes on a purplish blush background and with slightly elongated tips. The bulbs contain an average of six cloves in a circular pattern and have no small internal cloves. The taste is medium strong, with a deep earthy muskiness and just enough pungency to let you know you're eating garlic but not enough to overwhelm. Their rich flavor makes them very appealing to the tongue as well as the eye. They are an attractive, early, tasty garlic that stores as well as any Asiatic or Turban as they want to get back into the ground in October and tend to sprout in the early fall. 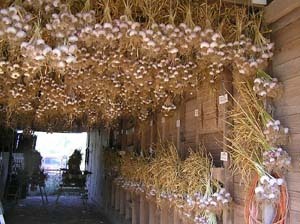 Because this early season delight doesn't store past fall, it needs to be grown in conjunction with some longer storing varieties like Porcelains or Creoles or Silverskins so as to insure having good garlic year around.